It’s been a while, but we are very pleased to be able to write to you today with the results of the first Space Warps project launched in May 2013. We asked for your help with finding lenses which may have been missed by robotic searches in the Canada France Hawaii Telescope Legacy Survey (CFHTLS) imaging. We have now combined and analysed all your classifications, and carefully sifted through the results. 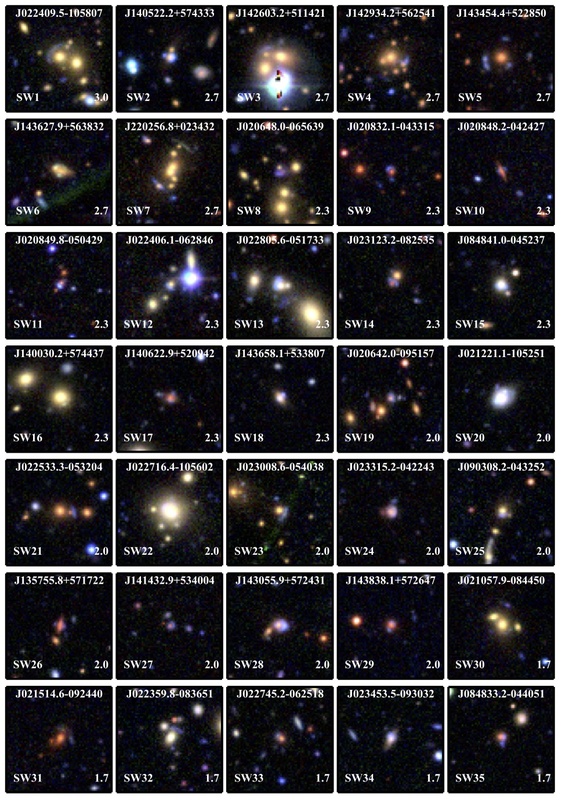 It’s good news: in addition to finding 80 previously published candidate gravitational lenses, you helped discover 29 new candidate gravitational lenses (and another 30 objects that might turn out be lenses). Nice work, people! We just posted two research papers on the “arxiv” pre-print server (where astronomers put their work for their colleagues to read), showing our results from our first project. You can check out the two papers here and here. The first paper is about how well “the system” (that’s you!) performed, in terms of spotting the sims and rejecting the duds. The second paper is about the new lens candidates that you found – and how they compare with the “known lenses” that two robots had previously found. We’ll be submitting these papers to an astronomy journal (Monthly Notices of the Royal Astronomical Society) in a couple of weeks, so if you have comments or questions about either paper, you can post them as “issues” on the Space Warps GitHub repository, and we’ll work them into the text in the meantime. Thanks! So, what do we mean by “candidates” that “might turn out to be lenses”? A few of the objects you found are clearly gravitational lenses – we can tell just by looking at them. For those that are less obvious, making a model that reproduces the image configurations seen can give us more confidence. While we were working on putting the sample together, Rafael Kueng and Prasenjit Saha wrote up a test of their web-based lens modeling software, which some of you took part in – you can read their paper on the arxiv too! Here is an example of what astronomers can do with the candidate lenses that you discover – Since you found this amazing red ring (called 9io9 based on your popular choice) in the VICS82 project last January, Jim Geach (co-PI of VICS82) and his team have been busy making more observations with a variety of telescopes. They recently finished analyzing the data. Jim, Aprajita and others helped confirm that 9io9 is indeed a lens with spectroscopy, and Anupreeta and Neal Jackson (University of Manchester) made a well-constrained mass model of the system to understand how magnified is the red galaxy in the background. This red lensed galaxy turns out to be pretty interesting – check out the paper to find out more. Thanks for all your classifications, these are very exciting results! So, we’ll post a complete overview of all our recent progress tomorrow, but for now, here’s a trailer: check out the CFHTLS results paper. New lenses!